Welcome and thank you for your interest in PhiLings Plasma Education with PhiAcademy New Zealand. PhiAcademy is a global organisation that provides professionals with top class educations and the best engineered equipment and pigments.To ensure your success, PhiAcademy New Zealand train in the latest techniques, hygiene standards and marketing practices. It is our aim to create top quality professionals in the industry. We strive to do this by providing you with proven training programmes, manuals and a safe educational environment to maximise your potential. Amanda and Michaella, Co Directors of Skin Revision and PhiAcademy NZ, draw upon over 30 years of experience and education in all aspects of beauty therapy. Their passion for knowledge in this dynamic, ever-changing skincare/beauty industry ensures that they stay informed with the latest technologies and skincare. An advocate for safe practices and high professionalism, Michaella and Amanda work with both industry leaders and governing bodies to achieve a unified approach to reaching excellence within our industry.  New Zealand, Northland Representatives of the Beauty NZ Professionals Association, ensures that they are informed about the latest legislations, standards. health and hygiene requirements. The Plasma Pen is a revolutionary treatment fast becoming very popular worldwide. This unique course provides the highest standard of products, service, knowledge and practice in order to gain the experience and confidence required to perform the treatment effectively. The PhiLings Plasma technique is the ultimate skin rejuvenation and tightening treatment and education. Also known as: Microneedling, Fibroblast Treatment, Soft Surgery, Non-Surgical Blepharoplasty or Plasma Tightening, PhiLings is a revolutionary and minimally invasive treatment that tightens and firms skin with instant results. To enrol in this education you must have experience in the Beauty Therapy or Cosmetic Tattooing Industry, it is not suitable for beginners. The PhiLings palette consists of two anti-ageing, rejuvenating and bio-regenerative, complementary and equally important treatments that can be used in combination or separately – Microneedling and Phi-Ion (Plasma Pen). In the PhiLings training you are taught to deal with both of these to the same extent and trained to be able to properly combine and use them professionally. The PhiIon Pen (Plasma Pen) creates an instant reduction of excess tissue without the need for surgery. Each and every client deserves an individual approach in their skin rejuvenation journey. It is your role to be well equipped with devices, techniques, knowledge and an after care programme. This is held at PhiAcademy in Whangarei. A convenient option for clinics wishing to train multiple staff members to save on time and travel costs. Contact us at: students@phiacademy.co.nz to learn more. In addition to the theoretical aspects, the course covers practical requirements to perform the treatment and provides practice on a live model. This is an intensive two day training workshop where you will be introduced to Microneedling and Plasma techniques. Upon completion of the workshop, you will have three months online training and support through CraftMaster, the online learning platform and your Master Educator, Michaella. Upon successful completion of your CraftMaster learning levels and case studies, you are graduated to a certified PhiLings Artist, receive a globally recognised certificate, unique logo and are endorsed on the PhiAcademy World Map.